The 11-year-old gave me his advice at the breakfast table, “Smile a lot, but not a regular smile, a scary one; and don’t blink; oh and leave your hair like that,” he said gesturing at my wild morning mane. 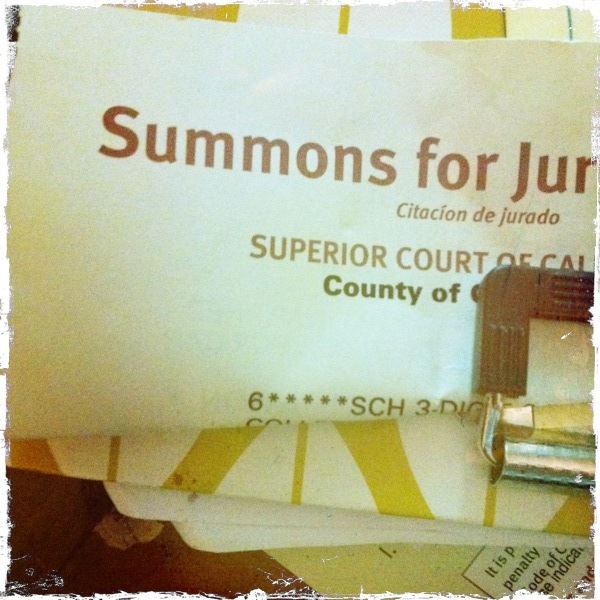 My number was quite literally up – I had jury duty. After blithely and incorrectly assuming I would be excused by phone, I packed my purse with reading material, then as I do at the airport, proceeded to make a spectacle of myself at the courthouse metal detector. Close your eyes and picture “Jury Assembly Room.” Got it? Whatever image you conjured up is likely correct. Did you also imagine the emotionally unavailable clerk handing out questionnaires and clipboards? Yes, you did. The last time I was filling out paperwork with total strangers en masse, I was taking the SAT, which is likely what brought out my competitive streak in the Jury Assembly Room. I triumphantly turned in my paperwork – second! Second one done in that whole room of people! I was all the way back to my seat when I realized I had made a potentially grievous error. What if my paperwork efficiency was the sign of an eager and capable juror? Perhaps I would have been better served by taking forever with it and acting confused. The clerk came to the podium, and instead of giving out awards to the people who finished their paperwork first, he hit play on the VHS tape DVD of smiling former jurors telling us how fulfilled we were about to feel by the process. The people watching the video with me were not smiling, nor obviously anticipating fulfillment. There was a grown-up Sesame Street thing happening – there were as many people of different heights, ethnic backgrounds, and walks of life as you could fit in a room. I sat behind the nurse, and the plumber sat behind me, flanked by the elderly gentleman with the crossword puzzle, and a dude with a Big Gulp. The young guys with computer bags sat interspersed with ladies in business suits and ladies in sweat suits. Was she looking at me? Did she know I had considered the advice of an 11-year-old to get out of this? The judge was obviously a mother, because she knew right where to strike to make us squirm in our seats, look at our shoes, and feel bad for being such whiners. She was right – we weren’t like those bums from jury groups 5, 6, 7 and 8 who were excused over the phone the night before. We were the jurors of groups 1-4! We had to cancel doctors’ appointments and hair appointments (that was me) and meetings to be there – we were outstanding citizens! The sexiness of civic duty waned over the next three days however as we sat through voir dire, which is a much cooler way of saying jury questioning. We heard from an EMT, the nurse, a real estate agent, a bookkeeper, a financial analyst, a gaggle of scientists and retirees, a lifeguard who could not imagine a universe where he could be unbiased, a furniture salesman, two teachers, a liquor store owner, and a lady from the Teamsters Union who I also had lunch with. As a nosy curious person, this process should have been fascinating, but the questions were long, tedious, and repetitive – often ending with “Do you watch CSI?” and “Do you understand that CSI is a fictional show?” You’ll be happy to know, they did. When I least expected it, I heard, “Ladies and gentlemen, we have our jury,” from the judge who motioned to the group that did not include me. I gave a nod of goodbye and good luck to the Teamsters lady who sat in the jury box surrounded by the truck driver, three of the retirees, two of the scientists, the nurse, the liquor store owner, one of the teachers, and the furniture salesman. I stepped out into the sunshine, feeling free and light and also wondering how I got to be so low on the selection list. Was it random? Was it because I worked at a church and was married to a pastor who had also attended some law school, which I absolutely made sure to mention during my awesome paperwork-completing on day one? I’m afraid that the most likely scenario is that somebody got his or her hands on the video footage of me trying to get through the metal detector. I loved this. You have mad writing skills. That is so funny! I could completely picture this scenario unfolding like this – right down to the advice the morning of. lol! 🙂 I’m glad you were able to escape, if only just barely! I keep thinking a certain part of this post is my favorite and then remembering another favorite part.